With the evolution of technologies, Barcode technology has extensively benefited all the POS users across the world. Recently, in the business aspect, this technology offers many benefits. Before the evolution of barcode technology, making the record of sale was a difficult task for all the retailers as well as POS users. Initially, there was no concept of description with the product in POS which resulted in the problematic task for the POS users to identify the products. But, with the emergence of Barcode in POS, it was easy to know the each and every details of the product whether it is a detailed description, units, price etc. Webkul has launched an application “Odoo POS Barcode Screen/ Odoo POS Barcode Display” which displays the large screen for the product along with its detailed description. In addition, this module helps all the POS user view the different screen for the product and the details of the product are shown in the totally different screen. Detailed view of products is shown in barcode screen. 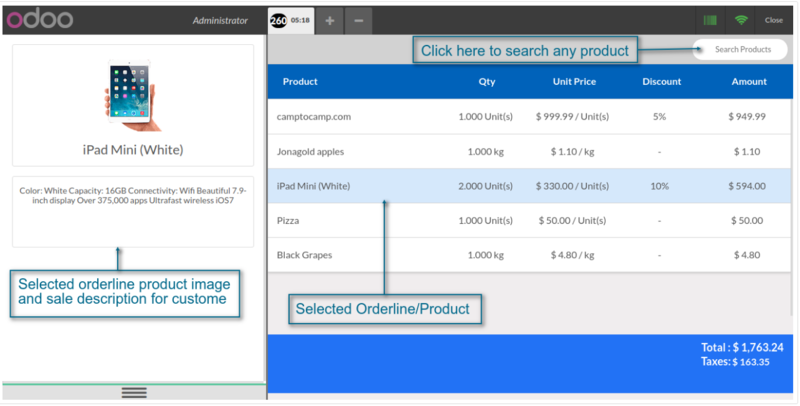 A bigger image with a product description for the customer is shown for selected order. The seller can activate/deactivate barcode screen view at any time in running session. Let’s have a quick peek into the functionality of the module. 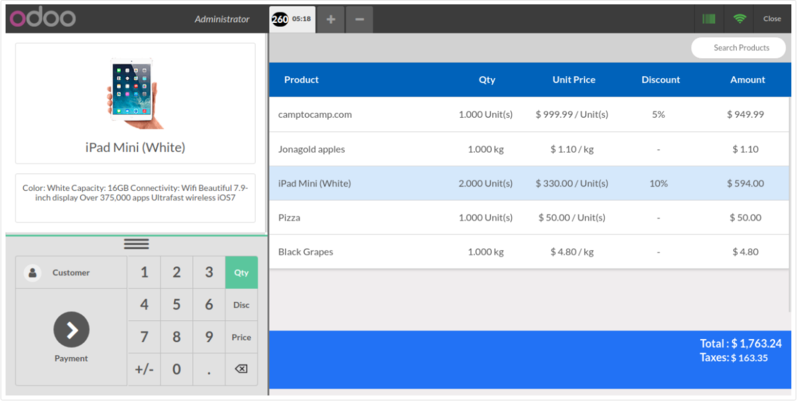 In the beginning, just activate the barcode screen in order to display the different screen while adding a product to the cart(refer to the screenshot below). While adding the product in the cart, a different screen is displayed which comprises all the details of the product in detailed form. Now the screen displayed will show the product image in the order line along with its description. Also, in case you want to search for the products you can do it by click on the “Search Product” tab. At the backend, just enable the option “Show Barcode Screen”. After enabling this option, barcode option will available in POS Cart. This is a simple, straightforward module which displays the different screen to show the detailed view of a product when they are scanned by a barcode. 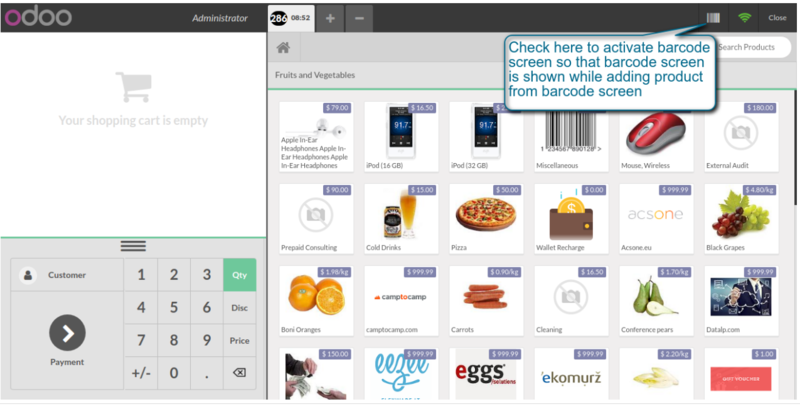 Odoo POS Barcode Screen is the module which displays all the details of the product in front of the POS user which proves to be convenient for the POS users. This will make the task easy for the POS users to complete the transaction. This was the detailed description of the blog. Stay in touch with us for the more interesting blog on POS. Click here to https://store.webkul.com/Odoo/POS-Point-of-Sale.html. Please do not forget to share your feedback and suggestions with us in the comment box given below. The Webkul Support is always available for you. You can simply, raise the ticket at https://webkul.uvdesk.com/en/customer/create-ticket/ also you can write to us at support@webkul.com.